To be included on this blog is an honor in itself. Thanks to Mitch Breitweiser for the awesome character suggestion this week! Ooooh! I love your rendering! Excellent! Sharp! Definitely some of your best work. Great stuff! Man, that window is awesome! That's class man! The window is really great, and it helps define the figure in front by its lack of rendering. It is an honor to be among these talents... I can see why you're included! 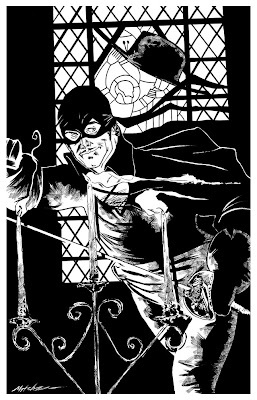 Really smart - love the face and the stained glass and those *wicked* candles. Thanks everyone! This whole thing is a trip, i'm having a blast! It's so cool to think what will come next week from everyone. I'm with everybody else, Mitch! One o' yer best! That's really great, Mitch. I especially like his expression. Yeah! Great work on the face and the window!